Jinxy Knows Best: Organic Chicken at Whole Foods Only $1.99 per Pound on Friday - Plus What Does it Mean to Be Organic? Organic Chicken at Whole Foods Only $1.99 per Pound on Friday - Plus What Does it Mean to Be Organic? 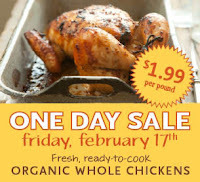 Visit your local Whole Foods Market this Friday, February 17th, and get organic whole chickens for only $1.99 per pound! The chickens must be raised organically no later than two days after they hatch. Plus, all of the chickens sold at Whole Foods Market are rated using the Global Animal Partnership’s 5-Step™ Animal Welfare Rating program!